Force Sight: Miraluka rely on their ability to perceive their surroundings through the slight Force vibrations emanated from all objects. In locations where the force is somehow cloaked, Miraluka are effectively blind. Visas Marr was a Miraluka female from the Mid Rim world of Katarr who lived during the time of the Jedi Civil War and the period of unrest that followed in its wake. In 3,952 BBY, Katarr had been chosen to host a secret Jedi conclave, which consequently drew the attention of the Sith. Darth Nihilus, one of the leaders of the Sith Triumvirate, brought devastation to the world, as well as the Jedi Order. He consumed all organic life on the planet, yet left Marr alive, albeit with damaged vision. She was taken aboard his flagship, the Ravager, and after she was made his apprentice, a Force bond was forged between the two. Afterward a servant of the dark side of the Force, she traveled with Nihilus beyond the Outer Rim. In 3,951 BBY, Marr was dispatched into the galaxy to seek out a growing presence in the Force and bring its cause before Nihilus. Marr found the center of the phenomenon she sought: a former Jedi, exiled by the Order before Nihilus's rise to power, who had returned to known space. She ambushed and challenged the exiled Jedi, who defeated Marr. Impressed by the Exile's abilities and the destiny that she perceived about her, Marr allowed herself to be swayed to the light. Forsaking her master, Nihilus, she became an informal apprentice to the Exile, teaching the elder ex-Jedi about the power of her Force-sensitive species. The Miraluka traveled with the Exile and aided in her endeavor to save the Jedi Order by locating those Jedi Masters who had been absent from the convocation. Later that year, Marr played an instrumental part in resolving the Battle of Telos IV, in which she met her former master in battle, and triumphed. In the process, she overcame the remaining shadows of her past, coming to terms with the destruction of her people. Soon afterward, the Exile confronted and defeated the two surviving members of the Triumvirate, Darth Traya and Darth Sion, at Malachor V, ending the Sith's program to eradicate the Jedi. Shortly before her death at the hands of the Exile, Darth Traya prophesied of Marr's return to Katarr and her pivotal role in rebuilding the Jedi Order. In the year 3,952 BBY, Visas Marr, a young Miraluka female, was living on her homeworld, the Mid Rim Miraluka colony of Katarr, when the planet was chosen to host a secret Jedi conclave to discuss the hidden dangers the Jedi had recently faced. Seven years prior, the Jedi Knight Revan, a hero of the Mandalorian Wars, had founded a new Sith Empire and pronounced himself a Dark Lord of the Sith. He, along with his apprentice, Darth Malak, had declared war on the Republic and the Jedi Order. In the intervening years since the conclusion of the war, the Jedi had been disappearing, hunted down one by one. The Miraluka, as a species, were innately Force-sensitive, and the Jedi had hopes that the intensified Force energy on Katarr would provide them with a measure of clarity. One of the leaders of the Sith Triumvirate, Sith Lord Darth Nihilus, who possessed an insatiable hunger for the Force, was drawn to Katarr by this gathering of those strong within it, from where he lurked beyond the Outer Rim. Unable to ignore this emanating pulse of Force power, he consumed all life on the planet, wiping out the Jedi who had gathered there. Marr alone remained alive to bear witness. Miraluka were typically made uneasy by the presence of something untouched by the Force, and when Marr not only saw, but experienced, the obliteration of life through the Force, the pain and shock of the severed connections left her unconscious and near death. Taken aboard Nihilus's ship, she awoke to find that the flesh where her eyes would have been had been removed. Distraught, she sought out the Dark Lord, questioning why she alone had been spared. Fractured and vulnerable at best, overwhelmed by the dark power surrounding him, Marr allowed Nihilus to take her for his own. In an attempt to make her believe in his cause, Nihilus showed her a vision, forcing her to see the galaxy in a way that her people never could; sentient beings on other planets, disconnected from the life surrounding them, unable to feel the Force. The vision severely damaged Marr's Force Sight?which she, as a Miraluka, had to solely rely on, having no physical sight?and she became convinced that all life must die. She came to believe that Nihilus fed upon the ugliness of the galaxy and left silence, and that the removal of this wretchedness was bringing stillness and order to where there once had been chaos. Accepting Nihilus's unspoken invitation, Marr became his apprentice, and was given a meditation chamber, in addition to living quarters?which she called her cell?aboard the Ravager. As Nihilus's Shadow Hand, Marr was compelled to do her master's bidding. About one year later, she felt a growing disturbance in the Force. Perceiving it as a faint echo rippling through the galaxy, she sought out her master to inform him of the phenomenon, only to find that he had felt it as well. Curious and perhaps uneasy with the discovery, Nihilus demanded to know if Marr was capable of tracing the origin of the anomaly. After confirming the possibility, he sent her to find and bring the source to him. Marr's search for the origin of the echoes lead her to the Jedi Exile, a former Jedi General in the Mandalorian Wars who had lost her connection to the Force during the war's culminating battle at Malachor V. The general alone returned to Coruscant to answer to the Jedi Council and defend her actions in disobeying them by joining Revan in his crusade against the Mandalorian threat. As a result, she was exiled from the Jedi Order. After roaming the Outer Rim for nearly a decade, the Exile had returned to Republic space and was being hunted by Sith assassins who believed her to be the last Jedi Knight. In an effort to save the Jedi Order, the Exile set out on a mission to find the Jedi Masters that had not been present at the conclave on Katarr. During her journey, the Exile experienced a burgeoning reconnection to the Force and any subsequent decisions she made sent tremors throughout the Force, thus allowing Marr to find her. Marr infiltrated the Exile's starship, the Ebon Hawk, incapacitated the crew, and engaged the Exile in lightsaber combat?only to be defeated, wounded, and have her lightsaber broken. Convinced of the Exile's superior strength, Marr yielded and begged the Exile to end her life, for the alternative was death by her master's hand for her failure. When the Exile refused, Marr pledged her life to her, seemingly abandoning Nihilus before losing consciousness. The Exile then took the unconscious woman to the ship's medical bay. This act of mercy was met by surprise from the Exile's companion, the pilot of the Ebon Hawk, Atton Rand, who was uneasy in the presence of powerful Force users, as the Miraluka were known to be. He also expressed his amazement at seeing a Miraluka Sith, saying that he had heard of Miraluka Jedi, but never Sith, further speculating that he was unsure as to how to go about killing one. The idea of killing Marr was met by incredulity on the part of the Exile, who voiced her regret for having hurt the Miraluka during their duel. Rand reassured her that Marr's injuries would heal, noticing that even though some of her wounds were severe, she looked like she had suffered from many more in the past. While Rand grudgingly accepted Marr, Kreia, the Exile's informal master, met her arrival with barely concealed contempt. She was of the opinion that the Miraluka's ability to see through the Force was wasted on her people and that she should be considered a servant. 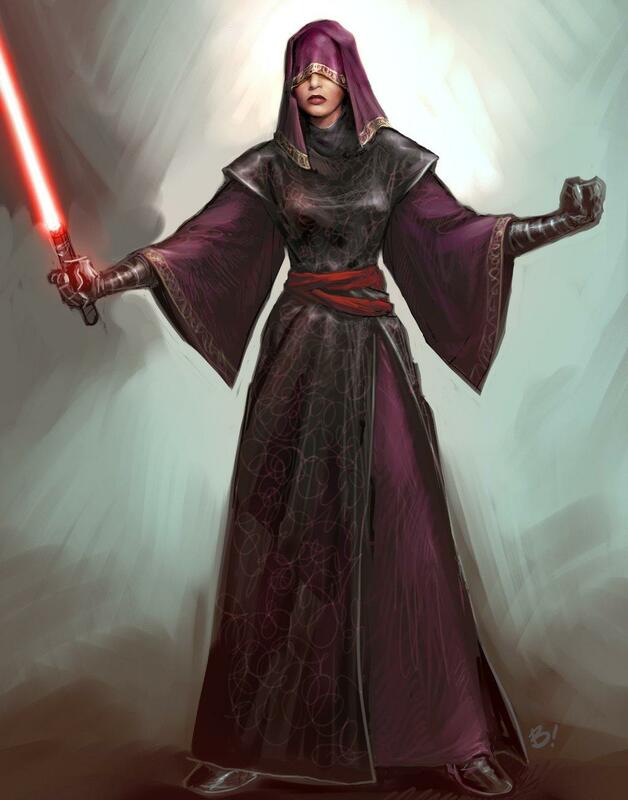 Furthermore, Kreia felt it necessary to remind the Exile that the Sith were often betrayed by their own apprentices and that even though Marr had pledged herself to the Exile, she was bound to other masters, thus insinuating that Marr's loyalty would always be suspect. Wary of Kreia's attitude towards Marr, the Exile nonetheless sought her advice regarding the change Marr had brought about in her eyesight during their clash. While Kreia explained this alteration of the Exile's perception was nothing that hadn't already been present, the elder woman had nothing but utter disdain for the forceful and "crude methods" that were the mark of the Sith. Marr's first genuine encounter with the Exile left her disquieted. Unused to the mercy shown by the Exile not only toward her, but others as well, Marr believed that this type of action would weaken the Exile for the enemies she had to face in the near future. Nevertheless, impressed by the Exile's skills, Marr rediscovered hope and came to consider that the universe was perhaps not as her master had showed her, and that, with her help, the Exile would be able to stop him. The fact that her master neither understood nor saw the Exile as she did was of some comfort to her. However, Marr cautioned the Exile that she would need to understand why this was so if the Exile was to have a chance of defeating Nihilus. She refused to guide the Exile to him untested and without her potential realized, as Marr felt the Jedi was not yet ready to face such a threat. She foresaw that the Exile and Nihilus would meet in the near future, however. From that moment, Marr devoted herself to the light side and to the search for the remaining Jedi Masters. Her admiration for the Exile continued to grow, and from her the Exile would learn to see through the Force as a Miraluka could. When the time came for the Exile to finally confront Marr's former master aboard his flagship, the Ravager, following his assault on the planet Telos IV, Marr refused to be left behind, intuiting that her presence would be essential in vanquishing Nihilus. Likewise, Mandalore the Preserver, who had been traveling with the Exile in order to gather the scattered Mandalorian clans, insisted that he and his troops lead the charge into battle, claiming that his warriors were the most capable for the task. 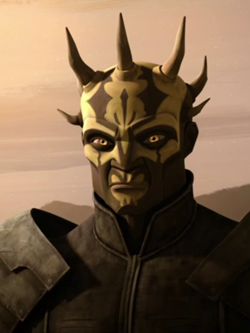 Arriving on the ruined ship, Mandalore announced that he would be accompanying Marr and the Exile to the bridge, asserting that he didn't trust the Exile to complete the mission. However, his low opinion of the Exile's capabilities was not so much directed towards her specifically, as it was a general belief that anyone who was not a Mandalorian was ineffective. As they made their way to the bridge, Marr, with the Exile's blessing, took the time to visit her meditation chamber on the vessel one last time, finally coming to terms with the destruction of Katarr. Her new-found strength would see Marr through the trial ahead, not for vengeance but for the sake of all life. In a final test of allegiance, Marr confronted Darth Nihilus with her fate resting solely on the Exile, who gave her the chance to stand up to the one who had wounded her. As they were taken aback by the Sith Lord's powers, the Exile realized that Marr was a link between Nihilus and the power bound within the Ravager. Struggling as she was with the weight of that power, Marr exploited the bond to her former master and blocked his connection to the Force, momentarily stunning him. Together, Mandalore, Marr, and the Exile were able to defeat Nihilus. Before they could make haste to flee the destruction of the ship, Marr felt compelled to behold what lay beneath Nihilus's death mask in order to sever the last remaining bond between them. Soon after the death of Darth Nihilus, the Exile confronted and defeated the last two leaders of the Sith Triumvirate, Darth Sion and the Exile's former teacher, Kreia, who had re-assumed the title of Darth Traya. 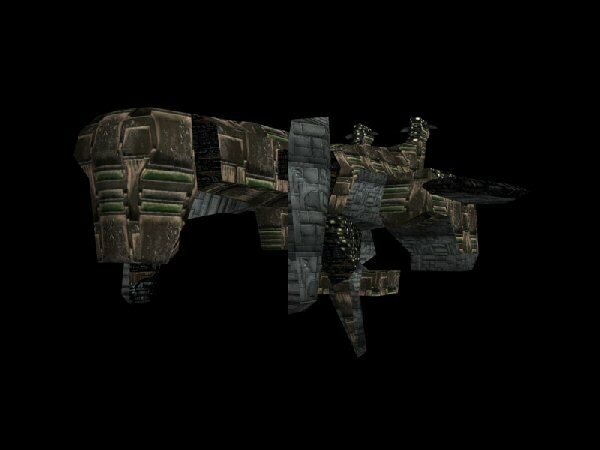 This last struggle took place at the Triumvirate's headquarters, the ancient Trayus Academy, located within the depths of Malachor V's craggy surface. This final battle brought about the end of the shadow conflict that the Jedi had faced since the end of the Jedi Civil War, and Marr would play a role in the subsequent restoration of the Jedi Order. Furthermore, according to Darth Traya's final predictions shortly before her death, Marr returned to her homeworld and, looking upon its surface, finally saw what she was meant to see. The Miraluka were acknowledged as individuals strongly committed to their chosen course of action, as was evidenced by Marr's dedication to help the Exile in stopping her former master. Nevertheless, the trauma of seeing her world die through the Force left Marr shattered and vulnerable, her Force Sight damaged. Darth Nihilus took advantage of this and twisted her psyche until she became utterly subservient and hopeless, disconnected from herself and life, a mere shell of a being. Marr's defeat at the hands of the Exile proved to be the catalyst that allowed her to break Nihilus's hold over her and restore her own free will. She confessed to the Exile that the very fact that the Exile's nature had eluded her master gave her hope that he could be defeated. The search for the Jedi Masters reestablished Marr's connection to life and believing the Exile responsible for this, she vowed to protect her. Although she never quite lost her servile attitude, Marr's journey with the Exile allowed her to gain the confidence and self-respect that ultimately severed the final bond to her former master and enabled her to rediscover herself. Like all of her species, the Miraluka, Marr was born physically blind and instead relied on Force Sight to see the physical world,] which included the ability to see through walls.] 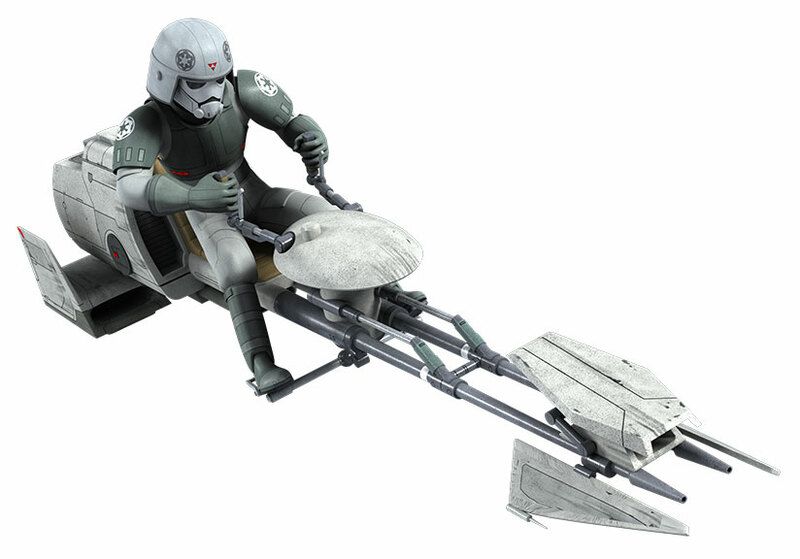 Though this Force power was a characteristic of the Miraluka, it was not species restrictive and Marr would later teach its use to the Exile. Her sense of the Force was highly developed, as was evidenced by her detection of the Exile, from across the galaxy, during her time as apprentice to Darth Nihilus. The depth of her Force-sensitivity granted Marr the ability to manipulate the Force to move or control the direction of objects through space. This was commonly known as the "Jedi's object movement power," also referred to as telekinesis. The use of this talent included pulling and pushing objects with minimal effort. In addition, she may also have been a practitioner of farseeing, as she was able to 'see' the eventual showdown between her first and her final master. Furthermore, Marr was highly skilled in the use of what were considered to be dark side powers, such as grasping and choking enemies, as well as unleashing raw dark-side energy. Her connection to the dark side gave her the use of Dark Healing, an ability that fueled regenerative processes by draining the life force of another. Marr's return to the light side following her defeat at the hands of the Exile allowed her to continue training as a Jedi Sentinel. Because of her training as a Jedi Sentinel, she was later given a yellow-bladed lightsaber by the Exile, which served to extend her knowledge of lightsaber combat.